It seems to me that every time I am in Assault on Bronze Tomb 90+% of people are unsure of how the map works and what the best ways are to attack and defend on this new map. The game ends with one team not really knowing how they won/lost. Hopefully this guide will allow the map to be played to the fullest extent to which it was designed. I will break it up into attack and defense for the map, and how each team should go about playing their respective roles. It consists of three rooms with capture points in each of the rooms. The rooms unlock sequentially when a crystal in previous room is captured. When this map first came out attackers had it easy. They could get to the crystals and quickly cap them before defenders really knew what was going on. Now it isn't that easy. The defenders spawn closer to the crystal than the attackers so they will always win the footrace to each crystal. As well as this they will see if you try to zerg one side and just follow the giant mass of red names preventing you from easily capturing the point. The crystals are shown in blue and the black lines demarcate the upper floor (it is a little hard to see in the blurry image otherwise). 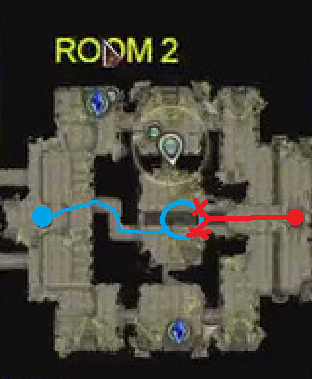 Red is the route that attackers should take to gain easy control of the first room. It is vitally important to gain mid control. People should only go for the crystals after mid control is on lockdown. The beauty of this is that once you have mid control you are really close to the defending team's stairs that lead to each crystal. From here you can pick either direction to a crystal to keep them guessing and get an easy take. Once Room 2 is unlocked you should have an easy take if played correctly. 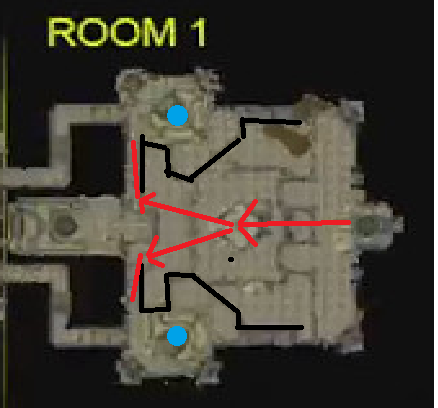 Often what has happened when capturing the first room the defenders will still be piling on you in mid in Room 1. You need to keep fighting these guys in the first room to progress and ultimately win the map. What happens here is that When you die and res, you will automatically spawn in Room 2 (easy territory gain). From here you should drop to your left and grab the crystal that is closest to your spawn point while the people still alive in room one are busy stopping the defenders from retreating. 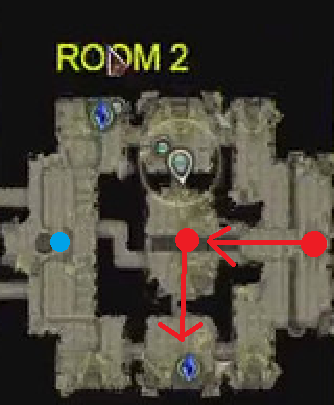 Any Defenders that die and respawn in Room 2 (see image - blue circle) are much closer to the other crystal and will have an easy time defending it. In the image, attackers are going from right to left. Once you have captured the close crystal in Room 2, you should again prevent defenders from retreating to the 3rd room. 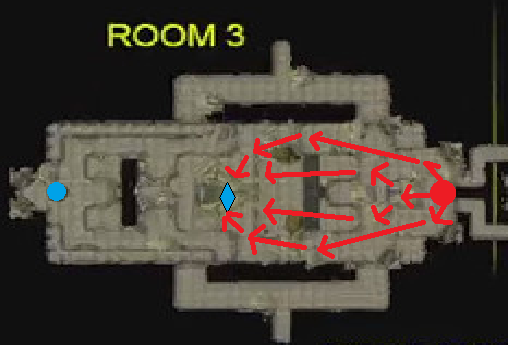 The way to do this is to find the remaining defenders in Room 2 and fight them to stop their retreat into Room 3. Once you have killed all their defenders its time for the mega battle in Room 3. Work your way into Room 3 and just keep zerging into the crystal. There are usually heaps of defenders around but you should be able to easily overpower them through zerg. Once you eliminate all the defenders you should finish the attack off with an easy capture of the 3rd crystal. Here you can see there are 4 lanes to zerging their crystal. As well as this, the defenders are just as far away from it as you are, meaning that no matter what they do they should be overpowered by brute force. As you can see, once you get into Room 3 attackers should win easily as it is impossible to defend Room 3 against a well-coordinated attacking plan like this. Prevent Defenders retreating into Room 3 from both Rooms 1 and 2. It seems that people are more unsure about how to defend compared to attack. This guide will show a solid defense strategy that when executed, will allow you to prevail. This room is designed so that it makes it difficult to sit on the crystals as there are massive fire circles that damage you. Instead you need to take the fight to the attackers to stop them gaining map control advantage. It is vital as a defender to hold the middle of the room. You should have a strong hold over middle to prevent attackers from sneaking up your defensive stairs for easy crystal takes. Hopefully you hold onto Room 1 for the entire match as the attackers will not be able to capture your crystals using this defensive setup. If you are unlucky and the attackers somehow capture your crystal, it's okay you still have Room 2 to defend. Hold the middle of the Room to secure your defense and stop the attackers working their way up your stairs. Avoid the ground AoEs near the crystals. 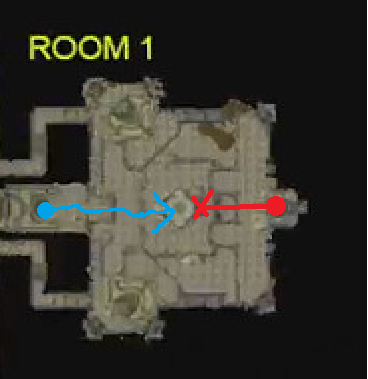 What you want to do once Room 1 falls is prevent attackers from getting into Room 2 to capture either crystal. Stay in Room 1 and stop the attackers breaking your mid control and going up your defensive stairs. If there are attackers still in Room 1 it is probably worth holding their advance through better positional play. When you respawn in Room 2, you again need to take the fight to the defenders. This is because spikes spawn everywhere around the crystals, making it hard to set up a defensive hold on top of the crystals. You should move through the middle corridor of this room and wait under their spawn to attack them and get easy kills when they drop down. Stay under their spawn and spawn camp for easy kills. This is probably the hardest room to defend, because the zerg rush is difficult to contain. It is easiest to hold them in Rooms 1 and 2 if attackers are still lurking or struggling to break through your ranks. Once attackers start spawning in Room 3 after dying, you will need to face your toughest challenge, the zerg. This image shows the best counter to the zerg. Take the fight to the attackers! The best defense is a good offense. They will gain quick width in the attack if you don't stop them early. I haven't tried activating the cannons because I find that it is much too difficult to go all the way to the activator portal (as shown in the map below), as it takes basically a minute to activate (as it is too much time wasted when the zerg in Room 3 is happening). As you can see, the blue lines are much longer than the red lines. The Zerg will capture your crystal even before you have a chance to activate the cannons. Once you respawn, push forward towards their spawn to cut off their rush to the crystal. Good luck to everyone playing this map. I look forward to some challenging matches on Assault on Bronze Tomb! In room 1 the enemies can just jump to either side from their base and go up the back stairs to the crystals. You absolutely cannot go to the middle and hope to win. You need to split half and half each side and have a few reserves watching either side in case of a zerg attempt. Well, in the first room you should go with all guys on one side. Now two things can happen. The others have splitted and you overrun the half raid of them and get an easy win. They focused also on your side and give you a fight. Then the one from your Team which die can Switch to other side and in most cases take it fightless because the defenders run to the side which you attacked. In both cases you take it faster then when you split and fight them splited on two raids. Now the most important thing for a fast victory is, that you don't kill any defenders when you toke a room. fi you kill him, you send them to there spawnpoint from the next room. If you don't kill them, they have to run back and in most cases you reach the last room before they get there. If they can groupe up in the last room they will hold it in most cases because the cannons. Thank you very much. I qued for this the first time yesterday and upon arrival i had no idea wtf was going on, it appeared most of my team had a similiar problem which resulted in a very quick loss. This gives me a great overview and touches on the vital components needed to form your own strategy in a given situation for victory or at least eliminate any confusion. 2 thumbs up for you effort! I agree, the best Defense is the Offensive manner. The Last room can be and is defended best by offing the zerg attack. If things start going south you can have 1 defender go start those cannons. The Cannons do get knocked out easy enough so Not relying on them in the first place is the Best idea yet.